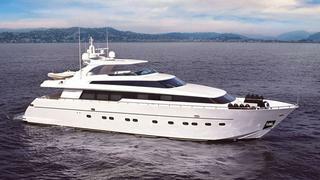 The 26.75 metre motor yacht GPS has been sold with Nicolas Valin at Neo Yachting representing both buyer and seller. GPS was built in GRP by Italian yard Sanlorenzo to a design by the in house team, with delivery in 2009 as an SL88 model and has had the same owner since new. MCA compliant, her interior styling is by Franco and Anna Della Role and she sleeps eight guests in four cabins consisting of a master suite, VIP suite, a double and a twin, all with en suite bathroom facilities. The saloon has an open plan relaxation and dining area, separated by a low credenza. The lounge is aft and offers a plush L-shaped sofa, coffee table and full entertainment system. Forward, the formal dining area seats eight guests comfortably. Panoramic windows give guests the option of ample natural light. The flybridge is designed for outdoor living, offering an al fresco dining option, comfortable seating, a triple sun pad and a retractable Bimini top. Powered by twin 1,850hp MTU engines she has a cruising speed of 22 knots and a top speed of 26 knots. Lying in Cannes, France, GPS was asking €2,650,000 and will be renamed Sky Khan.